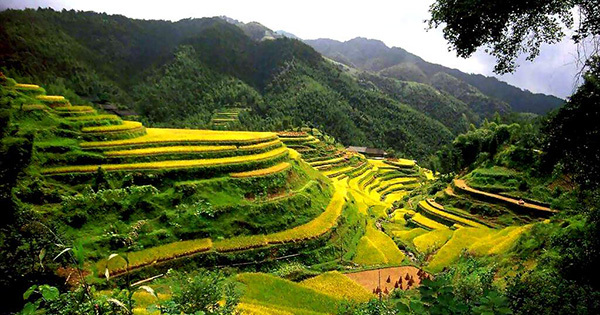 Sagada, a small quiet town in the Mountain Province, has been known as a backpacker's dream destination. Its natural cool weather, spectacular mountain views, and mystic caves are just some of the reasons it is considered one of the most ideal places in the Philippines to enjoy outdoors. #1 - Echo Valley and the hanging coffins: The locals' traditional and distinct way of burying the dead has long been a tourist destination in Sagada. The sharp cliffs where the famous colored hanging coffins are hung is one of the most accessible tourist spots in the area. It is located in Echo Valley, where tourists could enjoy a fun 20 to 30 minutes walk as well as rock climbing. #2 - Bomod-Ok Falls: Dubbed as the Big Falls, Bomok-Od is a natural majestic wonder with cold water cascading from the top of a contoured enormous cliff. Although going there takes about an hour or two from the main road, the trek is very encouraging because of the view of the landscape, rice terraces, hills, and valley. And the destination is truly rewarding too! #3 - Sumaguing Cave: Sagada adventure will not be complete without the spelunking experience. Sumaguing Cave, the deepest cave in the Philippines, is like an underground work of art for its wonderful rock formations that depicts human and things alike. The Lumiang Cave, which is often included as a side trip to Sumaguing Cave Tour, also offers a different yet spectacular experience. #4 - Kaman-Utek Hills: Famously known as the Blue Soil Hills, it is named as such because of its blue-green-colored landscapes. The place is surrounded by tall pine trees, lush greenery, and pitcher plants. It is believed that the possible reason for its unique color is its high content of chemicals like copper sulfate and the color intensifies when moistened. #5 - Mt. Kiltepan: If the place where broken hearts go truly exists, Mt. Kiltepan could be it. After just a few kilometers of walking, the view from above is so mesmerizing that all worries could be forgotten. The glorious sunrise over a thick blanket of clouds from its peak is the moment that shouldn't be missed.